Launch Sale! 66% OFF during a limited time! Enjoy! 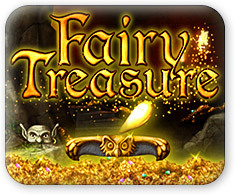 Fairy Treasure NEW POPULAR GAME! Fairy Treasure takes brick-busting arcade games into a whole new level! In your quest of recapturing the Fairy Treasure, you will travel along the Fairy River from castle to cave in level after level of fast arcade fun and gorgeous sceneries. Gather magic scroll parts to find hidden treasures, solve puzzles to unlock secret areas and collect keys to unleash the mighty chain ball. Fairy Treasure features more than 120 challenging levels of brick-busting fun in an astounding world of fantasy and magic. May the fairies be with you!